What is the potential economic value of opening the 5.9 GHz frequency band for WiFi use? What trade-offs are associated with realizing this potential value, in terms of existing and future trends and policies and in terms of how this spectrum could be allocated? Wireless communications — particularly those enabled by WiFi — play an indispensable role in generating economic prosperity and opportunity, yet there are few empirically driven estimates on how WiFi contributes to the economy. This report helps fill this gap by estimating the potential economic value of the 5.9 GHz frequency band — this portion of spectrum was allocated by the Federal Communications Commission for short-range vehicle-to-vehicle communications in 1999, but, as of 2018, reconsidering this band for WiFi use has become a subject of discussion. The authors detail two approaches for estimating the 5.9 GHz band's potential contribution to U.S. gross domestic product. They also estimate the band's contribution to consumer surplus and producer surplus, provide a sensitivity analysis for the estimates, and consider how current trends and potential future policies, such as privacy regulation, trade policy, and fifth-generation (5G) network deployment, could affect the estimates. The goal of these estimates is to help inform the ongoing debate regarding the 5.9 GHz band. This debate is particularly important because decisions made regarding this the allocation of this frequency band could set a precedent for future unlicensed spectrum policymaking. The 5.9 GHz band's annual potential contribution to U.S. gross domestic product ranges from $59.8 to $105.8 billion. Opening the 5.9 GHz band for WiFi could provide gains to economic welfare in the form of consumer and producer surplus of $82.2 billion to $189.9 billion. Factors that could reduce our estimates of repurposing the 5.9 GHz band include privacy regulation, trade policy, fifth-generation (5g) network deployment, and technology choices associated with communications between vehicles and between vehicles and infrastructure. This research was funded by the Comcast Innovation Fund and conducted in the Community Health and Environmental Policy Program within RAND Social and Economic Well-Being. 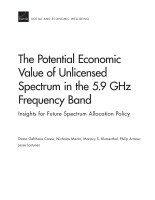 Carew, Diana Gehlhaus, Nicholas Martin, Marjory S. Blumenthal, Philip Armour, and Jesse Lastunen, The Potential Economic Value of Unlicensed Spectrum in the 5.9 GHz Frequency Band: Insights for Future Spectrum Allocation Policy. Santa Monica, CA: RAND Corporation, 2018. https://www.rand.org/pubs/research_reports/RR2720.html.